Review: Banana Kit Kat Bar (Chunky) | Oyatsu Break! One of the hazards of running a snack review blog is the inherent limit on how much you can write in a given time: i.e. : when you get sick of eating ridiculous, overly sweet “Chocolate” bars and soda-pop. 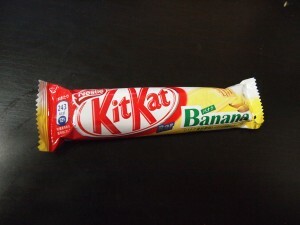 I actually had to take a two day break between Banana Bar and Green Tea Bar because I’d gotten sick of white chocolate. I have to admit, I don’t have the world’s biggest sweet tooth—I’m much more of a salty snacks guy. But there are a couple of artificial flavour concoctions that shoot to the top of my list, and fake Banana is one of them. Maybe it comes from the penicillin I was given as a kid that tastes like liquefied banana (chalky though! ), or the awesome banana milkshakes my best friends would make at sleepovers, but Banana-flavoured-anything is right up there in my top sickly-sweet artificial flavours, and let me tell you, Kit Kat Banana Bar delivers. 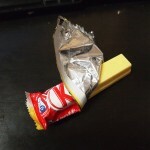 Packaging: Another winner in the Kit Kat Bar category. Clear, bold, English lettering for Banana, and a good photograph of a Banana on the outside—it also takes time to show that the bar inside is bright yellow! Smell: Purchased on my Spring 2009 trip and techinically “expired” before my tasting in March 2011, the scent of the bar leapt out at me as soon as I cracked the wrapper, over a foot away. There is no mistaking what this is going to taste like. Taste: Heaven! If you like fake banana flavour. If you don’t it’s probably some sort of abomination. 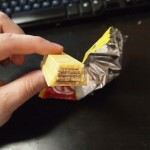 It has all the problems of the white chocolate Kit Kat bars in that it’s too sweet and the ratio of chocolate to wafer is off, with the chocolate fairly-coating the inside of your mouth. It actually surpasses artificial banana taste and starts to approach what a real banana tastes like, when you’ve got a mouthful of it… the texture and balance is also better then too, with the wafers diffusing the biggest flavours. But the intense scent and sweetness will quickly dispel any claims to authenticity. Verdict: It is exactly what it promises on the wrapper and I found it enjoyable, I’d probably grab one from the convenience store if some exciting new snack didn’t catch my eye. My husband on the other hand was entirely grossed out by it. 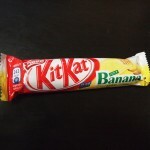 Kit Kat has produced 4 or 5 variations of Banana Kit Kats at this point, periodically reintroducing the flavour because it either sells well or they’re happy with the formula they’ve come up with. I’m guessing both, because I bought several and loved it, and it seems like an easy flavour for the public to get behind. But if you’ve never liked Banana-flavoured foods, this certainly isn’t going to turn you around. 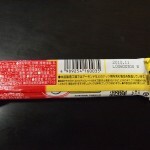 Pingback: » Review: “Ramune Blueberry Flavour” Oyatsu Break!